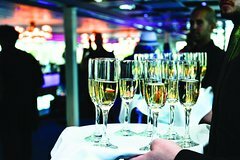 Christmas is a time for family, and Santa’s Christmas Eve Jazzy Champagne Brunch Cruise is just the trick for young and old. Let Hornblower do all the work with a decadent brunch buffet menu along with desserts and chocolate fountain. And the adults can indulge in free-flowing mimosas. Share the spirit of the season with amazing an atmosphere on New York harbor when the city is at its magical best. Amazing views, memorable times with friends and family, and so much more. Boarding docks are located at Pier 40 in the West Village. You’ll need to check in, and then you’ll board our luxury yacht. Once boarded you’ll be shown to your seats and introduced to your waiter. If you need anything or have any questions at any time, please be sure to let your waiter or one of our other friendly staff members know. Once the clock strikes 12pm, start cruising and enjoying all the Hudson River, New York Harbor, and East River have to offer. Shortly after the cruise begins, the buffet will be open for you to enjoy a bountiful brunch. Enjoy the surroundings and take in the live jazz being played by the band. When your stomach rumbles, head to the buffet. But be sure to save some stomach space for the sweet stuff; there is ample amount of dessert, as well as tea and coffee. While dining, you cruise by some of the world's most famous landmarks, including the Brooklyn Bridge, Statue of Liberty, the Woolworth Building, and the Empire State Building.